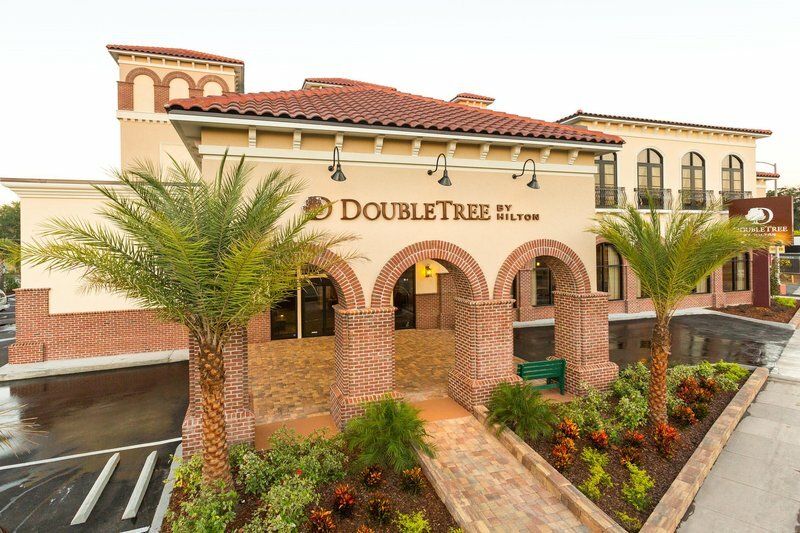 Relax with homelike comforts and warm hospitality at DoubleTree by Hilton Hotel St. Augustine Historic District. Savor our warm signature DoubleTree cookie at check-in and retreat to your spacious guest room. Each guest room boasts contemporary decor and modern amenities including 32-inch HDTV*s with premium HD channels. Stay connected to work and home with complimentary WiFi and work in comfort at the spacious work desk with ergonomic chair. Room service is available daily from 6am-11pm. Our onsite convenience store is also open 24-hours a day offering a variety of snacks and drinks to enjoy in the privacy of your guest room. This DoubleTree Hotel in St. Augustine offers an ideal setting for important business meetings and social events. Hold a wedding reception for up to 100 guests in our flexible meeting space and take advantage of the hotel*s stunning traditional exterior and tropical landscaping for a unique photograph opportunity. Our St. Augustine FL hotel also partners with the property next door offering additional meeting space. Business guests will appreciate the hotel*s complimentary WiFi access and complimentary car parking. Enjoy an energizing workout in the fitness center or swim lengths of the sparkling outdoor pool. H2O Grill - Pub offers a perfect spot to unwind after a busy day of sightseeing or business meetings. Gather with friends and family to enjoy a relaxed family meal or simply enjoy a quiet drink at the bar. Halal dishes are also available at our St Augustine FL hotel. Reservations must be cancelled by 72 hours prior to arrival to avoid penalty. Policy is subject to change. Relax in our cutting edge Oak Room Restaurant and Lounge featuring upscale American cuisine in a casual setting. Live Oak Restaurant and Lounge offers breakfast lunch and dinner daily as well as in-room dining in the comfort of your guestroom retreat. Florida's oldest gator attraction has plenty of scaly inhabitants, an albino alligator, and the late Gomek, stuffed former largest crocodile in Florida.